The Free Structure Theme from Organic Themes Returns! The Free Structure Theme Returns! The free Structure Theme was originally released way back in 2009 — eons ago by technology standards. It was the first WordPress theme from Organic Themes, and catapulted the growth of our business. The original free Structure Theme experienced explosive viral success. It received hundreds of thousands of downloads thanks to the praise and promotion of blogs like Smashing Magazine. We can only hope the new version of Structure experiences such success! Structure Lite is the latest reincarnation of the theme. We’ve brought it back to life, and we’re giving it away all over again! The theme has been entirely re-structured, featuring an updated minimal design, all new responsive framework and the latest WordPress functionality. The free Structure theme is currently in the review queue for the WordPress.org theme directory. 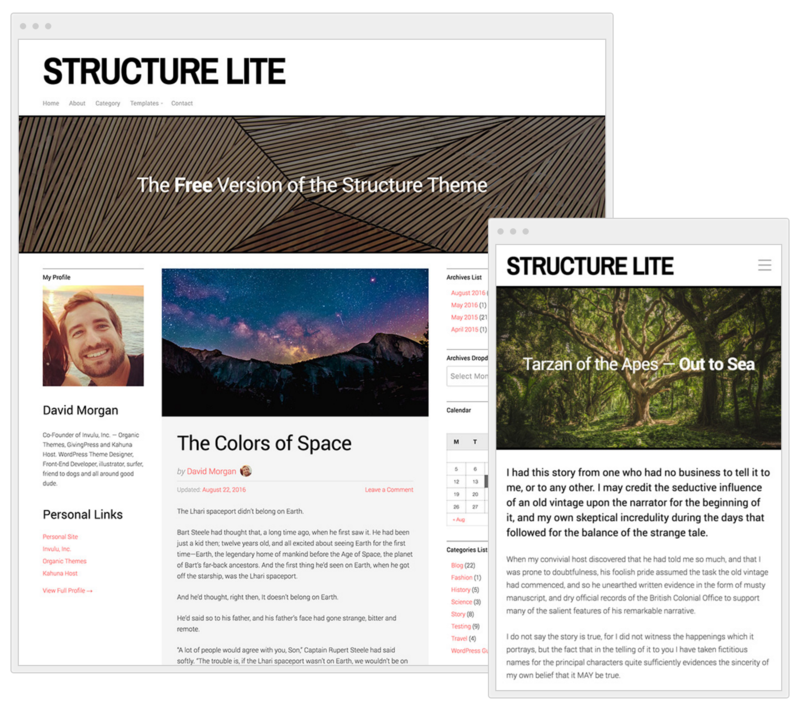 When the review has completed, Structure Lite will be the 5th free WordPress theme available in the official WordPress theme directory from Organic Themes. We release all free Organic Themes in the WordPress theme directory, ensuring that they are developed to the highest standards, and updates are continually available from the WordPress dashboard. Structure Lite is a simplified version of the Structure Theme. The simplicity lends itself to an ultra easy setup process within the WordPress customizer. However, Structure Lite doesn’t have many of the page templates, colors, options and additional functionality available in the premium version. Download Structure Lite now by signing up for the Organic Themes Free Membership on our pricing page, giving you access to all our free themes.